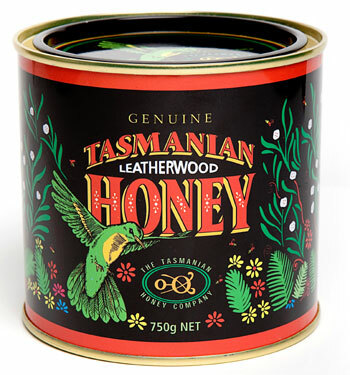 Tasmania Leatherwood Honey...The World's Finest & Rarest Honey! Genuine Tasmanian Leatherwood Honey, found only on Australia's remote unspoiled island, Tasmania, is produced by the Tasmanian Honey Company from the summer flowering Tasmanian Leatherwood Tree! In keeping with their philosophical commitment, the Tasmania Honey Company produces one of nature's most unique gifts...honey. Tasmania honey is naturally organic by virtue of the fact of where it is produced...from the unspoiled ancient rainforests located on the remote western side of an even more isolated, primitive island, Tasmania. Tasmanian Leatherwood Honey is monofloral, having a creamy to yellow ocher color, boasting an unusual floral bouquet. Complex on the palate, aromatic, yet musky & spicy, with a fragrance like no other honey. Leatherwood Honey...a robust aroma, a creamy & smooth texture,melt-in-your-mouth honey with a truly unique lingering flavor that is beyond description or compare!!! Foodies around the world have recognized Tasmanian Leatherwood Honey for over a century, one taste & you will know why!!! Please Note Size Shown is 26.5 oz. / 1.6 lbs.